In Today’s episode we talk about why you should take a Permaculture Design Course, what’s covered in a Permaculture Design Course, and what you’ll get out of it. It’s been cool to watch our compost piles here over the course of this winter. This past season, Realeyes Homestead was the composting site for Bay Area Recycling for Charities, the local commercial scale compost service in town. Over the course of the season we built up a collection of about 30-40 cubic yards of compost, made from the city food waste combined with local leaf and woodchip dropoffs. The compost piles stayed the warmest this winter, staying almost free of snow most of the winter, including melting the snow out about a foot away from the piles. This is due to the microbial activity of the decomposer organisms who are actively composting the piles. Active compost piles can reach temperatures of 160 or more! Although ideally they don’t go over 140. Even the piles of pure woodchips started heating up and melting the snow on them, although not as much as the actual food waste compost piles. The leaves didn’t seem to heat up or melt the snow much at all. We are very grateful to BARC and the local tree service companies for delivering all this valuable organic matter to our site. The soils on our land are very depleted of nutrients and organic matter from decades of unsustainable agriculture. When we took a soil test, it showed 0.0% organic matter! So in the beginning of our project, a big priority has been importing large volumes of organic matter onto the site to rebuild the soil. And it just so happens that we still live in a time where this organic matter is seen as a waste product that needs to be offloaded somewhere, so we are happy to be their offload point. In the future, when the cost or lack of fossil fuel energy makes it very costly and labor intensive to move such large volumes of heavy materials, it will take a lot more time to build up organic matter on a site. So it’s important right now to be stockpiling organic matter and doing all the heavy lifting and earthworks early in our transition off fossil fuels. Because it’s just gonna get harder as time goes on. Moving beyond the oil age, organic matter can be built on a site using cover crops, and trees to produce a layer of leaves each year, especially nitrogen fixing legume trees which build soil nitrogen levels while they grow. I hope you enjoyed today’s episode. As always I’m open to feedback, so let me know how I can improve these podcasts, or if there’s a specific topic or guest you’d really love to hear from. Thanks for listening. 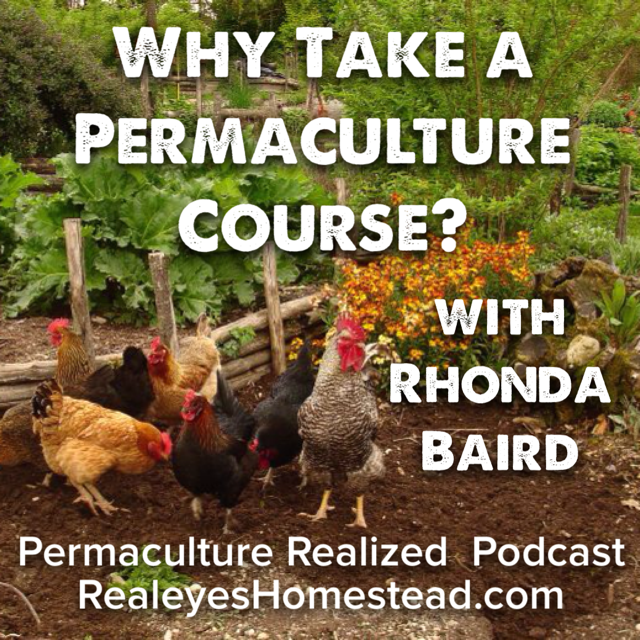 Stay tuned for more great talks on the Permaculture Realized Podcast.